Recently I asked the following question through my LinkedIn network. 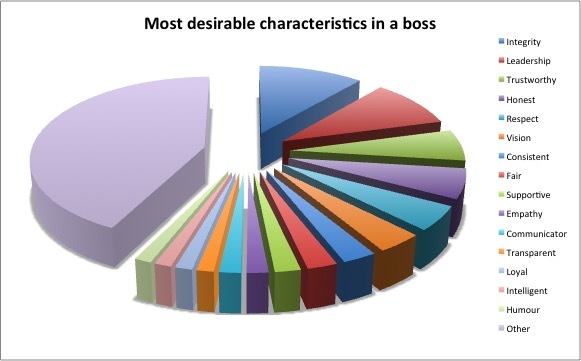 What one quality or characteristic do you most need to see in your boss? Over a couple of weeks I received 293 one word responses. I collated my findings and included them in the pie chart below. While going through the process of collating the information, I was forced to think about some of the responses. Some of the characteristics that I thought would have been important appeared far down the list. I then started to question why people responded with a specific characteristic. Did their contribution come from a sense of pain or even hurt? For instance, take the word 'fair'. I'd assume that this appears in the top 15 because a lot of employees have felt the injustice of being treated unfairly. This thinking obviously has far reaching implications. What are your first thoughts to this crowd-sourced research?